In 1893, a small group of Italian families settled atop a hill in Palisades Park. Previous to this, several Polish families had made their homes in the same area and built a small frame church which was to become the nucleus of the Italian Parish of St. Nicholas. The Church was closed for different periods of time since it was virtually impossible to conveniently establish a residence for a priest. Efforts were made by several Polish priests to keep the Church in operation for their loyal parishioners, but the attempts were futile. Meanwhile, the Italian families were noticeably increasing so as to form a small village close to the Church. An Italian priest took residence among the people and for over 20 years the life of the parish unfolded with great difficulty especially lacking in financial resources. The parish didn’t even have the means to support the priests. 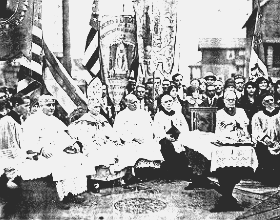 On March 12, 1923 the parish was canonically established and became part of the Archdiocese of Newark as “ST. NICHOLAS ITALIAN ROMAN CATHOLIC CHURCH”, and a rectory was provided for the priests to live. 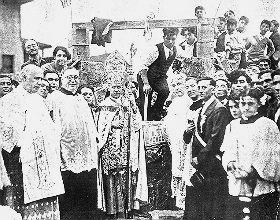 In May, 1927 the Right Rev. Monsignor Duffy, Vicar General of the Archdiocese of Newark, in the name of Bishop O’Connor, requested Rev. Ferdinand Anzalone, O.M.I., to assume the duties of the small parish. The following month Fr. Anzalone came to St. Nicholas. With the increase of parishioners, the new pastor requested of his superiors an assistant pastor to help in the running of the parish. Both priests sustained themselves with their own missionary work outside the parish, thus lessening the drain on the Church expenses. Little by little, the old Church became insufficient for the growing parish. The need for a new Church became imminent. The effort needed to accomplish this huge task was beyond the imagination of the parishioners. However, Fr. Anzalone, with his persuasive personality, initiated steps to provide the means to carry out the plans. Following the past of Fr. Anzalone on April 11, 1941 a new and saintly Pastor was established at St. Nicholas Church. Rev. Joseph Ferrecchia, O.M.I. took over the reins of guiding the parishioners of St. Nicholas. Ably assisted by Fr. DeLuca and Brother Girard, the three pioneers undertook the nurturing of the small parish to adulthood. At the time Sunday collections were at rock bottom – no more than $4, $6. It was only the determination of the priests and brother, working close to the vest, that the parish remained alive. Since there was no school, Fr. DeLuca drove the children to nearby Catholic schools via a hired bus. The financial struggle continued but collections on Sunday rose from $6 to over $40. Not enough praise can be given to these men for nurturing and keeping alive a Church that was laden with debts, struggling to keep together a small group of parishioners in a period of economic depression. They reformed the St. Nicholas and St. Anthony Societies and established the Holy Name Society and the Holy Rosary Society. It was because of the constant devotion to their leadership that the parishioners rallied around them. Progress was made slowly but there was progress. Additional Masses were added to the calendar, Sunday School classes were initiated, and several events were undertaken which proven financially beneficial to the Church. Every effort was directed to one purpose: To further the progress already made. In 1943 a newly ordained priest, Fr. Michael Gigante, from the American Province, was assigned to the parish. He initiated the Catholic Youth Organization (CYO) and became its Director. At the time a 12:00 Noon Sunday Mass was added which proved to be very successful. In 1947 Fr. Ponsiglione, a.k.a. Fr. Ponsi, a native son, joined the priest-community at St. Nicholas. Following a short period of service at the Church, Fr. Ponsi joined the US Army. He retired as a Colonel at 20 years of active duty as chaplain during the Korean and Vietnam Wars. Rev. Joseph Pucci, O.M.I., arrived at St. Nicholas in 1956 and was appointed Superior and Pastor of the parish. His primary function was to build a new school, rectory, and convent … a task of monumental proportion. Fr. Pucci hired a professional fund raising group to help him to obtain the necessary funds. The impossible dream was fulfilled and completed in 1958 with the gleaming School, Convent and Rectory standing as visible proof of the dedication and loyalty of all St. Nicholas Parishioners. With the arrival of the Filippini Sisters, as teachers, the “Little Church on the hill” proudly showed the new complex to the community at large. The project was dedicated in 1958 and Sunday Masses were increased to every hour from 7:00 am to 12:15 pm. Fr. Pucci and his priest assistants had performed a herculean task – one whose results would endure for decades. In the mid-60’s, after years of inertia, the parish C.Y.O. was reactivated by Fr. D. DiTrani. In 1962 Rev. Anthony Joppolo, O.M.I., was assigned to the parish as the new Pastor. Fr. Pucci, having completed his appointed task so successfully, went on to further endeavors for the Oblates. Fr. Joppolo, with infinite patience and ingenuity, continued to expand and improve the complex until a disaster beset the Church and community of St. Nicholas. One evening on May of 1965 the sound of sirens filled the air in the quiet community of Palisades Park. The wailing sirens continued their eerie call for a long period and the community sensed that it was more than a fire. Little by little the word spread that St. Nicholas Church was ablaze and parishioners were drawn as if by a magnet to the devastating sight of their church in flames. The priests had removed the Blessed Sacrament and were saving as many sacred vessels as possible. The most heart-rending scene was the sight of the Pastor, his assistants, and Br. Girard standing helpless as they watched the fire destroy their dream Church. Parishioners, young and old alike, were in tears as they watched the fireman do their part in saving what was salvageable. By late evening the fire was extinguished and the sad sight of a burned Church and the smell of charred wood were all that remained. Groups of parishioners stood about asking “why”. But God works in inscrutable ways and something good always results from a tragedy. The following morning was “First Communion Day” for St. Nicholas children and the ceremonies were held in the School Hall. Masses were conducted there until a large tent was erected on the school playground to house the parishioners at Mass for several months. Then the wheels of rebuilding went into operation. Fr. Joppolo rallied the parishioners for the purpose of not only refurbishing the Church and Church Hall but also to make both places of beauty. Every group in the parish worked towards this end. Mass was returned to the Church proper. Huge canvases hanging from the ceiling hid the damage from view. The front wall of the church was razed. Pews were removed and re-stained and the entire Church was repainted. In addition the Church Hall was enlarged to twice its former size. New stained windows replaced the old ones in the Church. A new heating and air-conditioning system was installed and rebuilding was completed. Hardworking parishioners and contractors gave of their time and effort to bring about the completion of the new “Little Church on the hill”. Under Fr. Joppolo’s wise direction, the complex was completed paid for. In 1971 the newly decorated Church was rededicated. In appreciation for his stint and in appreciation for his efforts the “Anthony Joppolo Church Hall” was dedicated. Not enough can be said concerning the Oblates of Mary Immaculate and their service to St. Nicholas Church. To the final days of their assignment they continued to perform the dual ministry of not only serving the parish needs but also of simultaneously fulfilling the goals of the O.M.I. order, namely, missionary service. In the late 1970’s Fr. Peter Abramo initiated his own version of the “Traveling Madonna.” Despite his physical disability, Fr. Abramo would faithfully bring the statue of the Blessed Mother to private homes, especially those of St. Nicholas’ growing Yugoslavian population. At the time he left in 1983, his special project which began with a mere 25 families, had touched almost 200 families in an ever-widening circle. Fr. Paul Pesenti, likewise, carried the missionary spirit of the Oblates beyond the borders of St. Nicholas. Under his tutelage, the C.Y.O. was extended to the Archdiocesan level; and here at St. Nicholas, it was accorded equal status with other parish societies. Fr. Paul also established a cub scout troup and instituted the Folk Mass. Rev. Ferdinand Anzalone, Rev. Giuseppe Parasiliti, Rev. James Miller, Rev. Joseph Ferrecchia, Rev. Robert Paradis, Rev. Anthony Joppolo, Rev. Archimede DeLuca, Rev. Attilio Ponsiglione, Rev. Domenick DiTrani, Rev. 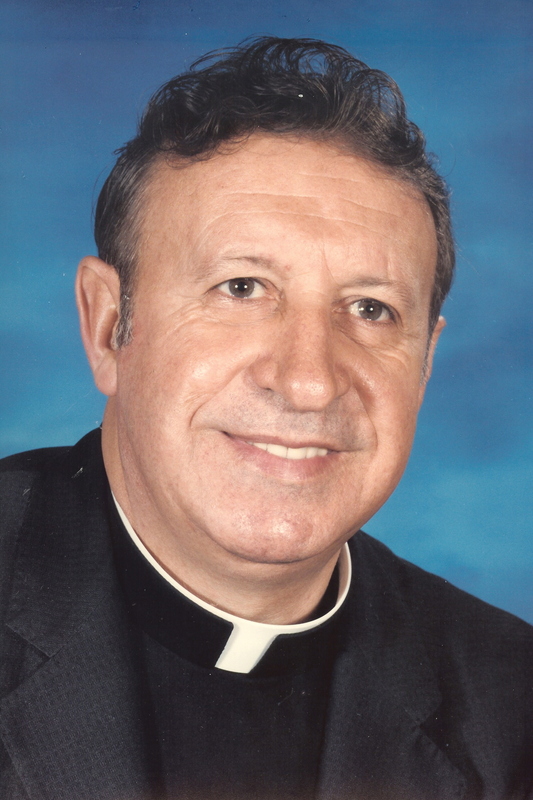 Umberto Carta, Rev. Angelo Mitri, Rev. Paul Pesenti, Br. Francois X. Girard, Rev. Alessandro DiTaddeo, Rev. Edigio Cortinovis, Rev. Michael Gigante, Rev. Joseph Pucci, Rev. Pietro Abramo, Rev. Marco Papa, Rev. Giorgio Cosentino, Rev. Peter Archiati, and Rev. Vladimir Manente. In June, 1983 the guidance of St. Nicholas passed from the hands of the Oblates to those of the Society of Divine Vocations (Vocationist Fathers). Reluctantly but willing, the parishioners accepted this edict coming from the Provincial Superior of the Oblates. Ours was not to question WHY, but to accept the change as God’s will. After 56 years of service to St. Nicholas Church, the Oblate Fathers were reassigned to various directions. In his opening address, in the occasion of his installation as Pastor of the parish, Fr. Ernest DePolvere, S.D.V. asked that we accepted him and his assistants with all our hearts and they would work fervently to endear themselves to us. This they did and today parishioners of St. Nicholas are proud to be served by such humble men. Priests and Brothers alike greet parishioners as close relatives, eager to help as much as possible. Fr. Ernest brought new vigor to the community. The bazaars, dinner-dances and other fund-raising events had but one purpose in mind: sustaining St. Nicholas School. Events in the Parish were successful and there was an air of ever-pervading happiness among parishioners. However, another blow devastated the parish. On July 20, 1986, Fr. Ernest was taken to his reward at the age of 51 years. Church fire was a blow – but it was rebuilt and enjoyed by its parishioners. With Fr. Ernest’s death, a living loving, and loyal person was taken from us. All his plans for the future were stilled in one instant. Six months following his death, parishioners of St. Nicholas received joyful news from the Archbishop of Newark. Although it was uppermost in the heart and mind of every “Nickolite” that Fr. Edgar da Cunha would be chosen pastor, his youthful years in the priesthood diminished that hope. However, in the deep recesses of every heart, hope reigned supreme. And then hope turned into reality … our wish came true. Word spread like wild fire throughout the community. Our own Fr. Edgar would take over the reins at St. Nicholas. He came to America from Brazil, attended the Immaculate Conception Seminary, and was ordained in 1982 and at the age 33 he became the youngest pastor in the Archdiocese. Years do not necessarily mean experience. Following the death of Fr. Ernest, he took upon his shoulders the administration of the parish with vigor, zest, and with an experience that belies his youthfulness. His warm smile, his open heartiness, and love for all classes of people have endeared him to every parishioner.